Thiri Kyar Nyo, manager of PR at telecoms company Ooredoo, talks about the region's comms revolution. What is it like to do business in Yangon? The city is geographically well situated, making it good for trading. Three rivers surround it and there is easy access to docks for shipping, an international airport, and a main railway station for inland transportation. It is one of the most beautiful cities in Southeast Asia, with greenery, ancient cultural heritage, and colonial buildings, making it ripe for tourism. After the EU and US lifted economic sanctions against Myanmar after the 2012 by-election, followed by the emergence of foreign investment law, businesses have bloomed. What sectors are seeing growth in Yangon? Sectors such as telecommunications, banking and finance, hotels and tourism, media, and PR and communications. The Government of the Republic of the Union of Myanmar has recently granted two new telecoms licenses to Qatar's Ooredoo and Telenor Norway, marking a milestone in the history of Myanmar. Do brands see PR and communications as an effective tool for growth in the region? Sustainable and responsible investments have been the talk of the town in recent years. Both local and foreign firms have started corporate social responsibility projects. They make these efforts well known to the public by using different aspects of PR and communications. The media landscape is still in flux with the recent lifting of censorship, the opening of the daily newspaper market to private companies, and the establishment of a new press council. Brands want to build long-lasting relationships with key and influential media across both traditional and social media platforms. Has the business climate changed significantly since pro-democracy leader Aung San Suu Kyi was freed from arrest in late 2010? Everybody appreciates the right collaboration between the government and the opposition, which leads toward better social, economic, and political change. Has digital and social media had an impact on communications? Digital and social media tools are inevitable for PR and communications during these years. Although Myanmar still has electricity blackouts and less than 10% of mobile penetration, more than 80% of Myanmar Internet users have a Facebook account. It is also a useful platform for brands, activists, journalists, and politicians to disseminate information in a timely manner. What are the main challenges that PR/communications pros face? The main challenges include localization of key corporate messages into Myanmar language using correct tone of voice, uncontrollable media and a lack of protocol, and English language proficiency among media. Introducing and communicating local do's and don'ts to companies is another challenge, as is the lack of resources for branding and, last, but not least, Internet speed. Is it hard to find the right talent and skills to develop a local team? No. Nowadays, a lot of Myanmar professionals who have lived and studied abroad for several years are looking for job opportunities to settle back home. Apart from that, young people here are intelligent and pick up new things easily. Once they are trained properly, they are headed in the right direction toward professionalism. How do you foresee the communications and PR industry in Yangon changing over the next few years? The speedier the growth of the economic sectors, the more this industry will blossom. Some big PR firms have already set up here. 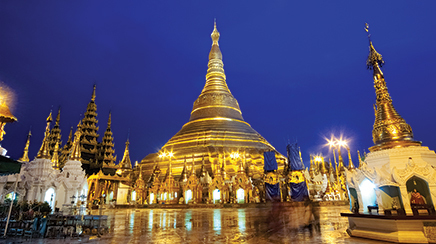 What do you love most about Yangon? The people - they are always ready to help you and are easy to communicate with. Also, I love the local and international food that is available, the cultural heritage, and access to the outside world in terms of digital communications and transportation.